Mail4Rosey: Enter to Win the Mpow Selfie Stick! Are Selfie Sticks worth the hype surrounding them right now? Oh you betcha, and then some! My husband is having a major blast running around, antagonizing the children to play, and getting a variety of fun shots with his new Mpow Selfie Stick. The Mpow iSnap X One-Piece U-Shape Self-Portrait Monopod Extendable Selfie Stick is great because it comes in one long piece that folds up to be very compact, making it easy for travel. The end of it is adjustable to fit to your phone, or in my husband's case, his iTouch. The twist clamp at the end holds your device securely in place. It's easy to turn, but holds fast and doesn't leave you at all wary to extend your expensive device so many feet in front of you while not in your own hand. It also comes with a wrist strap so if your dropsy like me, you can have an additional dose of peace of mind. Charging it is a breeze, simply plug it into your computer with the included charging cord. Again, everything is small so it's wonderful for travel. My hubby's taken quite a few pictures with it, and experimented too, seeing just how much he is able to get in the frame. It's definitely a new toy he's happy to have, and it's fun for the whole family too. No more partial people shots, with this little baby you're getting everyone in the picture. To get your Mpow Selfie Stick up and running, simply pair it with your Bluetooth device and it's good to go. Simplicity at its finest. It really couldn't have taken more than a few seconds to get ours going. This selfie stick is compatible with most IOS/Android devices. The Mpow Selfie Stick comes with an 18-month warranty, and a 45-day money back guarantee. You can find it on Amazon, and Mail4Rosey readers get a discount as well. Simply type in the code: LK35FSFH to save up to $4. Learn more about it by visiting the listing. You can also follow Mpow on Facebook and/or Twitter. One lucky winner gets a selfie stick to call their own. US entrants only. I always joked about selfie sticks until I found myself in a situation where one would have totally been really nice! :) Thanks for such a fun giveaway! My teens would love this! That would be me--forget it just as I really really need or want to use it!! I can't imagine the fun of actually getting everyone including me in a picture. I'd actually love a selfie stick! They'd be great for taking pictures when out and about and traveling. I would love to have a selfie stick, looks like a fun gadget to have. I am not very good with cameras to begin with and a selfie--uh--never thought that would ever be possible--for me at least! This does look relatively easy to use (remember I'm a total klutz)--and I might actually be able to take a selfie!! I have heard so much about these selfie sticks. I wouldn't mind trying one out! I know my kids would like it. I'm sure my hubby would make fun of me, but I would LOVE a selfie stick. I read the funniest article about how people couldn't figure out how to answer the phone when the selfie stick was attached. This is great! I need this thing I always get to travel and I want to take a selfie with beautiful places. I've seen many selfie sticks out there on the market. Thanks for the review of this one. I'm sure it helps a lot. Hehehehe nit gunna lie.... I made so much fun of these things for the longest time.... And then one day ended up reviewing one for my blog... And well don't tell anyone but I secretly love the thing!! I'm now included in families photos since I am the one usually taking the pics lol. It sounds like a neat idea. What a great giveaway! I love taking selfie with my friends, this one is what I want, I love this selfie stick. We first saw selfie sticks last October. Tons of people were using them at Universal Studios. I have since wanted to get one, as they would really make it so much easier to get group shots of the family without asking someone to do it for us! I love selfie sticks as they are very useful. They are very useful for those group shots. Great giveaway! I have never used a selfie stick before, but I have seen them in action. Fingers crossed that I win the giveaway! These are so helpful to have around. I always forget to bring mine with me. I'm glad mpow makes one now! Selfie sticks? Those exist? That's so much fun. I think I would antagonize the children as well! Lol. The selfie stick was a common white elephant gift this past Xmas, and all my friends were fighting for it. It's a lot of fun to use! I bought one of these recently, but can't get it to work with my iPhone that has a strong plastic case around it! I think this is a really cool product. I love that you can toy around. I only take selfies when I have to review something but very seldom. This would be great for those who love to take selfies. OMG -- my friends and I were just talking about selfie sticks last night. I'm so glad I saw your post today. Hope I win the contest! This would be great for my brother. He and his girlfriend are always on adventures and take many together-ies lol. I don't take many selfies, but sometimes selfie stick would come in handy when we are trying to take photos of the whole family while travelling. Have to enter the contest for sure! 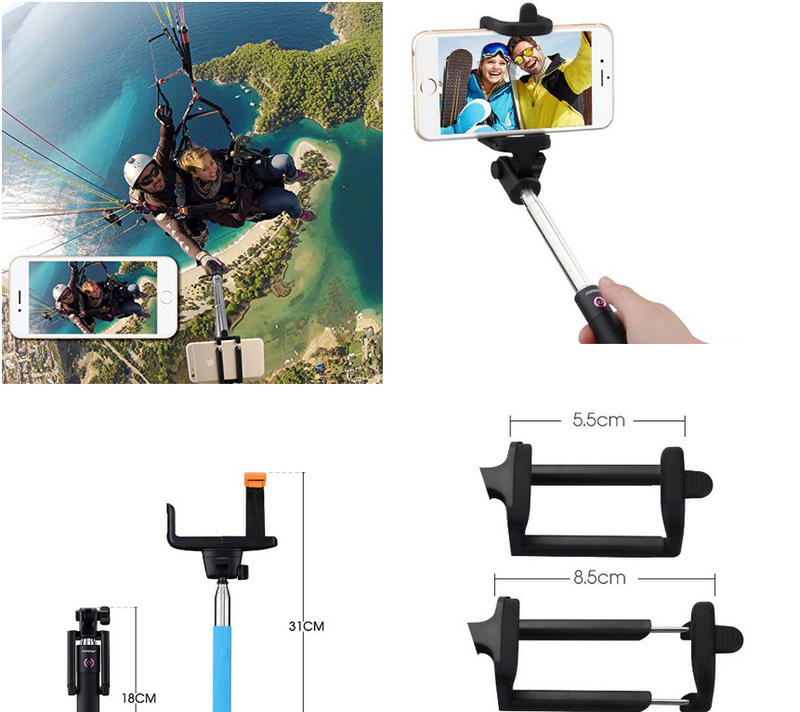 The Mpow iSnap X One-Piece U-Shape Self-Portrait Monopod Extendable Selfie Stick would be a great product for everyone in our family to use. My kid’s favorite kind of picture to take is the selfie and with this stick and their imaginations they may become the next great “Selfie group photographer”. This stick would provide hours of fun for entire family. I love that it is really easy to charge and connects effortlessly to our bluetooths. We need one (or five) of these! This is a great giveaways and I know my daughter would love one. This one is really handy. I like that it has a bluetooth enabled switch to take photos. I am terrible at taking selfies. I am hoping this would help me improve. I love my selfie stick! It's makes it a lot easier to take family selfies. My selfie stick kind of broke!! So, I need to get a new one. Being a blogger, these things come in so handy. This would've been great on our last vacation. I've been seeing a lot of these selfie sticks and think I would love to give one a try. Thanks for the opportunity to win one without having to buy one. My daughter and I are going to Disneyland and this might be perfect!! A relative of mine has one... she is obsessed!!!! I've never taken a flattering selfie. I need this! I would love to take better selfies with a Mpow Selfie Stick. this would be great to have at disney land. My mother-in-law needs one of these. She's always doing the selfie thing! I would like to try one of these selfie sticks. I could definitely use when I'm out backpacking by myself. I would love to be able to try the MPow Selfie Stick to take better photos of my husband and I together on our upcoming vacation. This would be great for our hikes and fishing adventures. And road trips. Thank You for the giveaway…my daughter wants one to bring with her to college this fall.